If you aren't sure what you want to send, this dazzling, bouquet of ivory White Oriental and Asiatic lilies is an excellent, neutral choice. 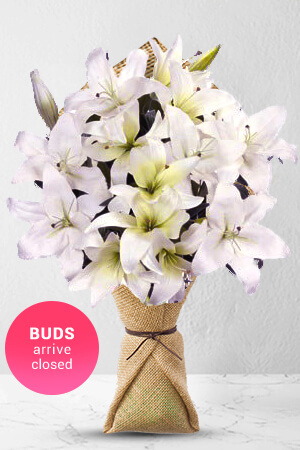 With a combination of stunning blooms and fragrant perfume, its natural elegance will impress the most discerning man or woman alike.Lilies may be sent closed/partially closed in order to prevent damage and to last longer - Vase not includedVase not included however to better personalise your gift, we recommend adding a Superior Vase to accompany these lovely Lilies. Would be 5 stars if you can send me a tax receipt/invoice at the time of order instead of me having to request this each time. Great service & excellent quality flowers, price was very good compared to company I usually use. I will be a return customer ?? Very impressed with the fact that I only placed my order the day before I needed the flowers delivered (order placed on a Sunday) and the flowers were delivered as requested - large bouquet with multiple buds to bloom over coming week or so and very fresh. The receiver was thrilled with her surprise gift! It was great. easy and fast. thanks.